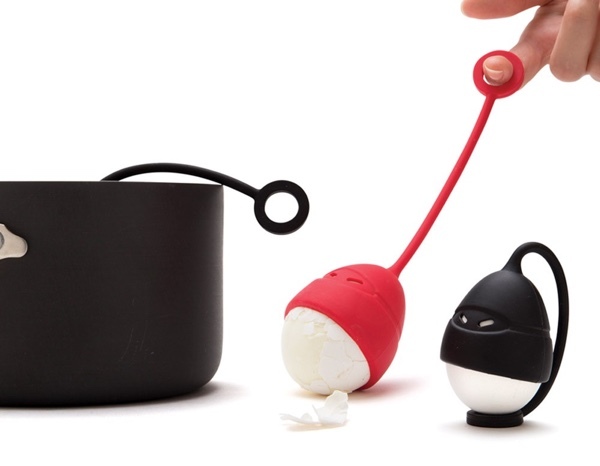 Egg Ninjas Make Handling Hard Boiled Eggs Easier | OhGizmo! By David Ponce on 03/03/16 • Leave a comment! Look, it’s not like this is a serious problem in the kitchen, but handling recently boiled eggs does require a little bit of finesse. That’s why the Egg Ninjas were created. Stick an egg in the silicone suction cup, leave the ring tag outside the boiling water pot and when it’s ready, just pull it out. You can then set it down on a table as shown in the picture, to let it cool. As it does so, your quests will giggle a little at your egg ninjas, then they’ll get bored of the novelty and just eat the darn thing. But at $13, it’s an inexpensive way to add a little bit of whimsy to your breakfast.